Another japanese food trip around Makati….can you guess where this is without googling the name of the resto? Appetizer on the house! Sotanghon with the variety of those balls (shrimp? or quikiam? or whatever…) I liked this appetizer, different from the usual….uhmm…I was about to say dilis (sweet anchovies) but isn’t that the Korean freebies? So now, it got me thinking…do Japanese resto give anything on the house? 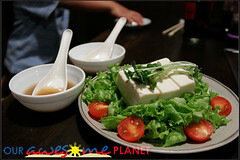 Toufu Salada (P190). This were the server’s sales pitch…”Paborito ito ni Gretsen.” (This is one of the favorite of Gretchen (who else?!)). The other salad is Gyusyabu Salad which has beef as toppings. Decided to go on a toufu salad as we were already having an all-meat yakiniku set. I failed you once again…I was trying to rely my memory but once again, it failed me…I can’t exactly recall the taste or even what to compare it with. I’m sorry but all I can say is that this salad was great! I wished I had one order just for me and the other for AD. Enma Ramen (P160). Are you up to the challenge wherein you test yourself on how far you can go with the hotness of this ramen? Enma ramen has a HOTness range of 1-20. Usually, Filipinos can manage the level 5 but Japanese can go higher. So, are you up to a challenge? For me, I thought I cannot take it but I did…the red color is deceiving! The only exciting part is if you can take it…if you can then it is time to take it to the next level and see if you can reach the level 20. I don’t think you’ll be able to appreciate the ramen very much if you decide to go on a higher level because you’ll be too much involved in wanting to try the level close to 20. The reason why we tried this restaurant was because this is the best pplace to have yakiniku (Japanese BBQ)…so we’re really looking forward for a great dinner. Horumon Santenmori (P1097). Seafood set that consisted 2 pieces prawn, 4 big round pieces scallops and 2 slices of squid, all seasoned with salt and peppah. 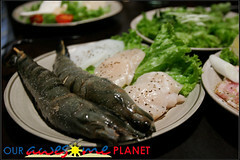 Timing is very essential in yakiniku style of cooking…especially with seafoods. Grilling it too long would be a no-no while taking it out the grill prematurely would be like having a gum in your mouth. Luckily, my timing was purrfect! We just loved how it was perfectly seasoned and right timing of grilling. But to be honest with you, I prefer the meat set over this. I hate to say this…but I need to cut short this entry…can you wait till tom for its continuation? I do hope so because there’s more food to come! This entry was posted on Thursday, October 30th, 2008 at 5:13 pm	and is filed under Outing, Food Trips. You can follow any responses to this entry through the RSS 2.0 feed. You can leave a response, or trackback from your own site.